That's 162 Grand Prix entries, 41 wins, 65 pole positions, 80 podiums and three world championships. 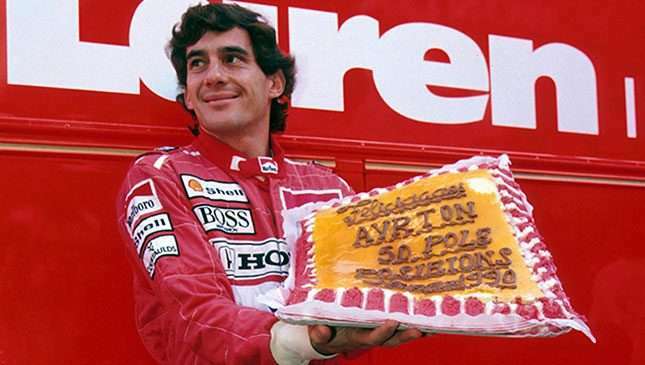 Staggering statistics for any F1 driver, but these extraordinary numbers aren’t even half the Ayrton Senna story. The Brazilian legend tragically passed away following an accident at the San Marino Grand Prix in 1994, his legacy cut cruelly short. 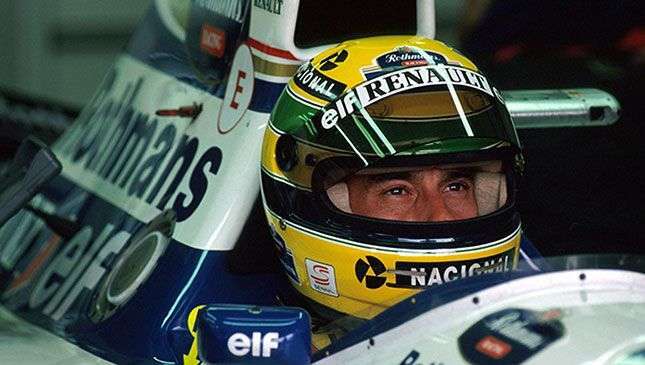 Perhaps the most charismatic, complicated, absurdly talented driver ever to grace Formula 1, Senna died far too young. But what memories. Dazzling pole-to-checkered-flag victories; storming drives in catastrophic weather conditions; that duel with Alain Prost and the rivalry that shaped both men’s lives. Senna’s racing career was the ultimate Hollywood story (and indeed, has been turned into one of the best documentaries of all time). Very few of F1's greats tug around at the back of the field for season after season before finally getting a break. 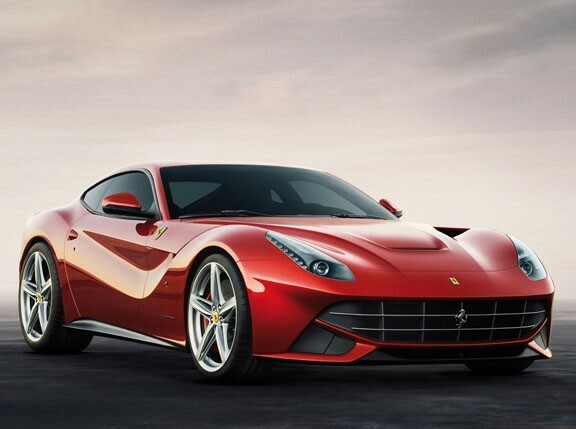 Perhaps they score big in a mediocre car, or defy the weather Gods in eye-popping style. Both, in Senna’s case. He’d tested for Williams, McLaren, and Brabham during 1983, but chose minnow Toleman because he figured he’d get the acclaim if he aced a race, and could blame the car if he didn’t. 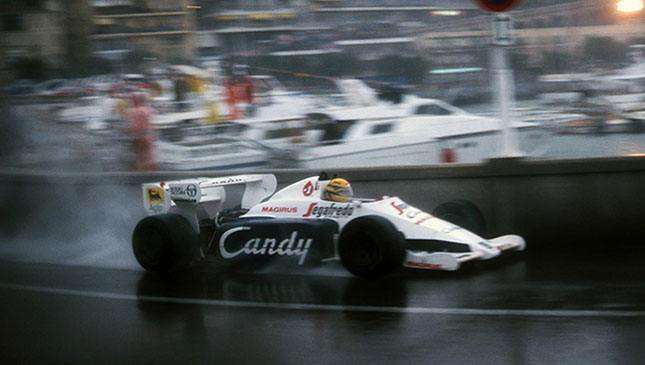 In only his sixth Grand Prix, in Monaco, the rookie Senna qualified 13th, then set about making the rest look silly as the heavens opened on Monte Carlo. Senna’s reputation for finding grip where there seemingly was none was forged on this day in May '84. He was reeling in future nemesis and race leader Alain Prost by three seconds per lap when it was red-flagged. Job done. His 17th GP, and only his second for Lotus. In conditions he later described as worse than Monaco, Senna again conjured grip and poise from the thin, cold and damp air around Estoril. He was more than 17 seconds clear at the end of lap 10, and 55 seconds ahead by lap 31, but it was Senna’s silky, sublime car control and economy of motion at the wheel of the Lotus 97T that really grabbed the eye. "I was lucky to stay on the road," he said afterwards. You’d never have known. "He approached qualifying like it was a religious experience," McLaren’s team manager Jo Ramirez said. 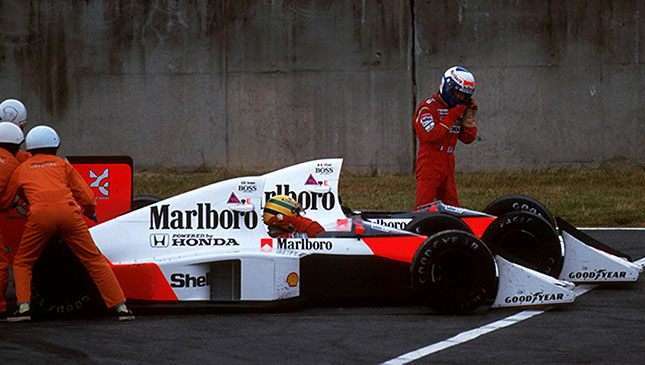 Only three races into his McLaren career, his skill and determination to outpace Prost raised Senna’s driving and commitment to an almost transcendental level. Lapping two seconds quicker than Prost, even he was spooked. "I realized I was well beyond my conscious understanding…I was way over the limit but still able to find more." Senna’s form in the race was equally majestic, until lap 67 when he slithered wide into the barriers at Portier and crashed out, handing Prost the victory. Senna hid in his apartment, while his cleaning lady fended off McLaren personnel. 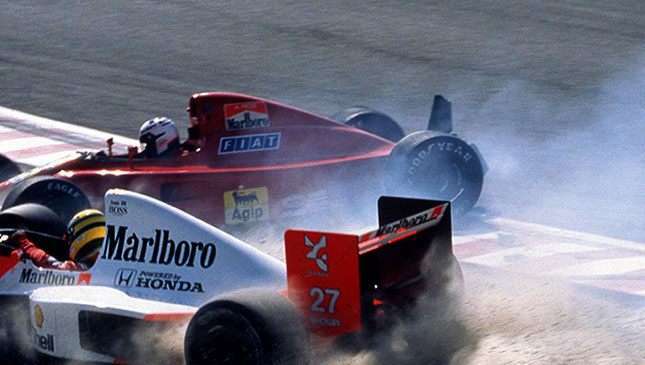 Scene of the infamous lap 46 collision, in which McLaren teammates Senna and Prost tangled on the entry to the final chicane, providing the denouement to a competitive relationship that had plundered new depths of acrimony. Senna restarted his engine, and continued the race once a new nosecone had been fitted. 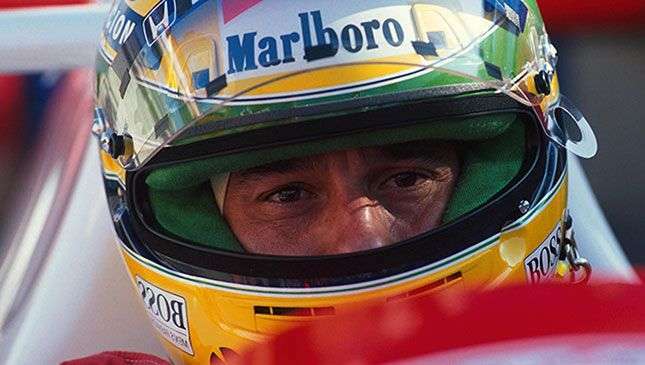 Manish Pandey, writer and producer, Senna: "If you want the essence of Senna—the psychological, emotional and mental makeup of the man—then his response to Martin Donnelly’s accident at Jerez in 1990 tells you everything. Martin’s crash was huge, a 274kph impact that split his Lotus in two and left him lying unconscious and still strapped to his seat in the middle of the track (Donnelly’s car had suffered a front suspension failure). 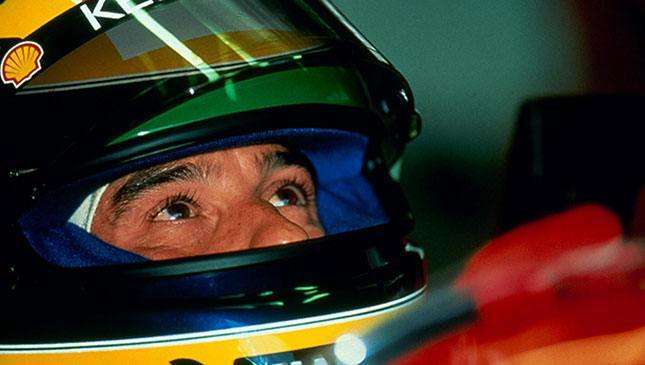 "Senna watched it all unfold on his monitor, and it affected him profoundly. What he did next demonstrates the purity of his position. He already had pole, but he went out again and beat his own time. He had nothing to gain, and he certainly wasn’t taking advantage of the situation. He was setting his own targets in his own mind. He went out there and basically told the track, 'you can’t do that to one of us. F**k you!' It was just something he had to do." Senna and Prost, now a Ferrari driver, collided again. Though on pole, Senna complained that it was on the dirtier side of the track, and lobbied for it to be moved to the cleaner one. The stewards initially agreed, but the cantankerous president of F1’s governing body, Jean-Marie Balestre, overturned it. "Senna wanted to change sides, and because he could not he was blaming me and Balestre," Prost said. "It was always his rules." Senna determined to be in front by the first corner, by any means necessary, leading to the inevitable. 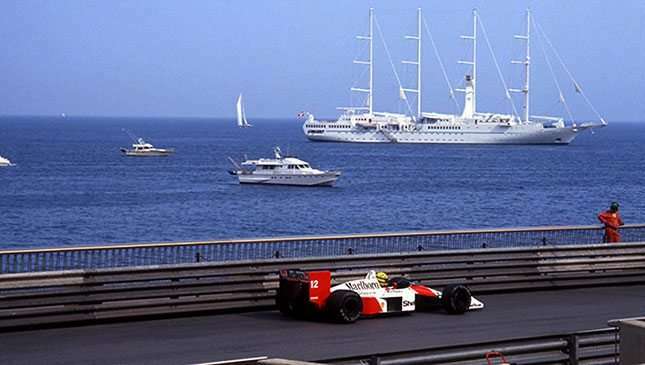 With Prost out, Senna’s unassailable points lead saw him win his second world title. 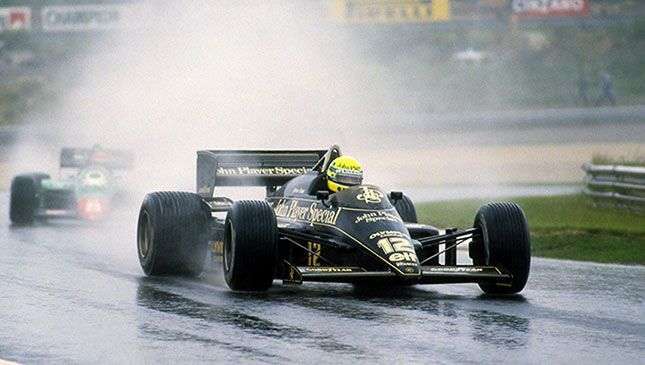 With seven laps to go, and with his gearbox falling apart beneath him, Senna had no option but to finish the race using only sixth gear, in rapidly deteriorating weather conditions. 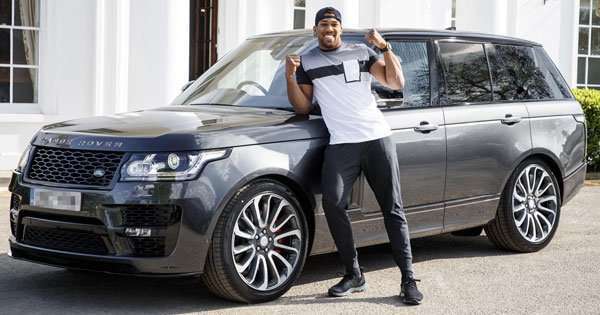 He won, but had to be helped out of his car, and almost collapsed on the podium. 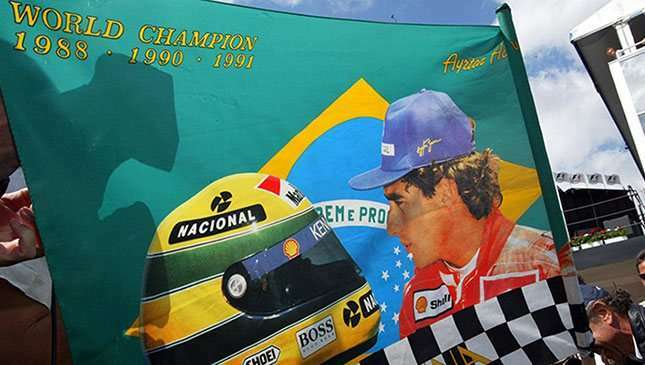 A win for Brazil, as much as for Senna, with more emotion than any man could bear. His McLaren was firmly eclipsed by the Williams, and rain was hardly unusual in the Donington area. But once again Senna had to combine his talent with a feel for the machinery and the conditions to produce an opening lap that’s become the stuff of legend. Having dropped to sixth at the start, he still ended lap one in first place, having overhauled Prost, Hill, and Schumacher. 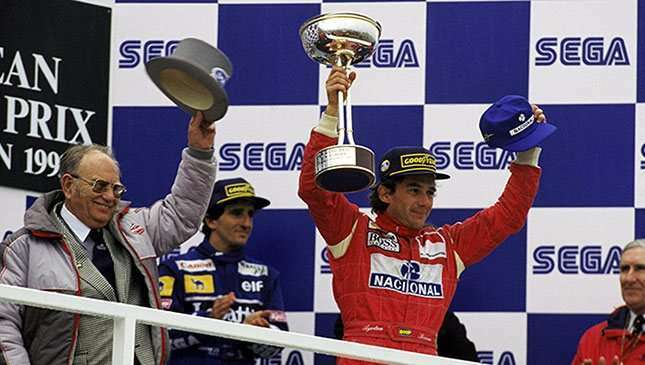 Sega sponsored the race, and Senna won a Sonic the Hedgehog-topped trophy for his trouble. Arguably the most haunted—and haunting—weekend in F1 history. Senna’s sister, Viviane, launches the Instituto Ayrton Senna, initially to help under-privileged children in Brazil, as per her brother’s wishes. Now one of the most respected NGOs in the world.